It was sudden. It felt like a giant lightning bolt struck the inside of her head. The flash of unrelenting pain fired from one side of her skull to the other. The sheer magnitude of the pain was beyond comprehension. She blinked, and she before she knew it, she was being rushed into an emergency surgery. Waves of pressure squeezed her brain like a giant vice crushing a tiny melon. Kathleen Newhouse’s entire world was crumbling from behind her eyes. The impending doom of a swift and certain death quickly started to sink in. A slurry of voices blurred into each other. Doctors concluded that Kathleen had less than a five percent chance of surviving, though there was a distinct possibility she could end up in a vegetative state. Kathleen was just a breath away from the other side. Waking up weeks later, Kathleen learned that she was nearly blind and became forlorn in a new realm of pain and fear. As her desolate existence slowly devoured her senses, she yearned for a comprehensible voice to cling on to. This was only the beginning of Kathleen’s quest. A vast and gloomy labyrinth stretched before her. The lone captive of a new, intrusive, and disorienting state of consciousness, Kathleen braved each surreal step forward, one at a time. 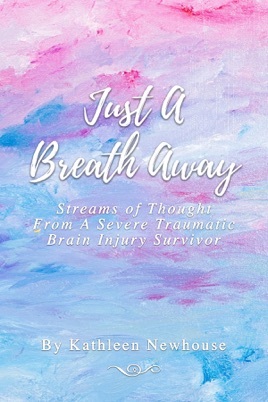 Each day since, Kathleen has been victorious, earning every word in her new title: severe traumatic brain injury survivor. Kathleen would only realize later that this nightmare was in fact very real. It was the first in a series of uncompromising tests leading to unprecedented self-rediscovery and reinvention. Kathleen’s determination, perseverance, and faith in God enabled her eventual survival. Along the way, Kathleen found a hidden treasure inside herself—a newfound talent for painting. Today she focuses her creative energy on this new craft and embraces every new sunrise as if it’s a mystery. Every tomorrow is a gift to Kathleen, like a new canvas awaiting her next brushstroke. Like a new morning, calling forth new possibilities from within her.